If you are like me, the words “soft-ball stage” fill you with fear and confusion. Just because you don’t own a candy thermometer is no reason for you to be deprived of homemade candy! 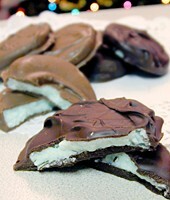 Peppermint Patties are as refreshing to eat as the are easy to make. They taste just like a York Peppermint Patty, only better. For best results use premium chocolate like Ghiradelli Candy Making and Dipping Bars. It’s more expensive but it’s worth it. In a large bowl, combine sweetened condensed milk, extract and food coloring. Add powdered sugar; beat on low speed with an electric mixer until ingredients are well mixed. Turn mixture onto a surface sprinkled with powdered sugar. Knead lightly to form a smooth ball. Working in batches, roll out the the mixture until 1/4 inch thick. 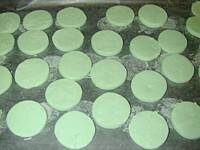 Using a 1 1/2 to 2 inch biscuit cutter, cut out the the mixture into circles or other shapes. Transfer them to a cookie sheet lined with wax paper using a thin metal spatula. Continue until all of the batches are gone. Let patties dry for 1 hour; turn over and let dry at least 1 hour. Place dipping chocolate in a large Pyrex measuring cup or microwave-safe bowl. Microwave for 1 minute. Stir. Microwave for another minute, stirring every 20 seconds, or until mixture is smooth. UsingÂ tongs, drop the patties into the chocolate, turn over, coating completely and transfer to a cookie sheet lined with wax paper. Let stand until firm. Store in an airtight container at room temperature or in the refrigerator. This entry was posted on Thursday, September 13th, 2007 at 6:43 am	and is filed under Desserts, Holiday & Seasonal, Master Recipe Index, Vegetarian. You can follow any responses to this entry through the RSS 2.0 feed. You can leave a response, or trackback from your own site.